We have a decent chance to see strong winds and hail. The SPC has us under a 15% chance for severe winds, which are 60 mph or stronger. 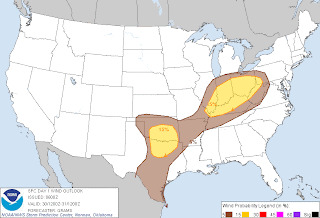 SPC also has us under a 30% chance for hail an inch or larger. This is a pretty significant chance. 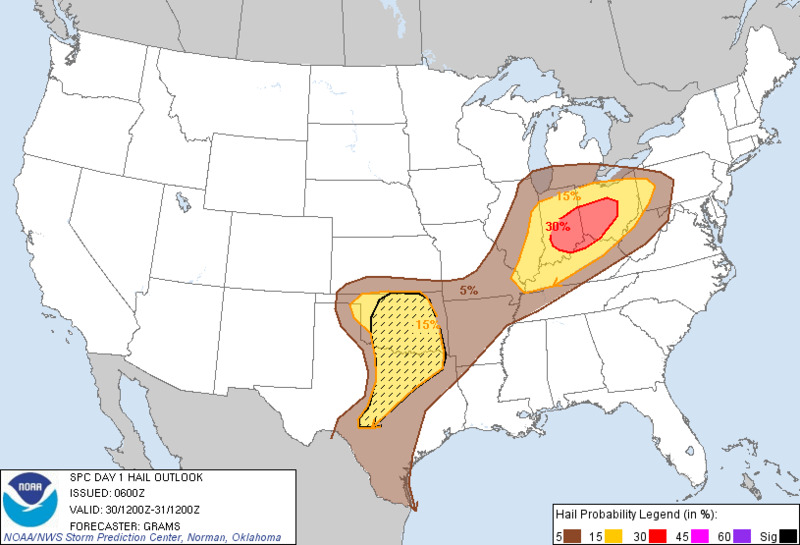 To round out the severe threat, SPC has us under a 5% chance for tornadoes within a 25 mile radius. This may seem low, but last Friday we were only a 2% chance and we had two tornadoes within the Miami Valley. It looks like I will likely be called back into work later today. We are dealing with showers this morning and MAYBE a rumble of thunder on the tail end of these showers just after daybreak. We will dry out for midday, but then the storms roll in later today. I think the first storms will start rolling into the Western Ohio around 5PM and then move east and out of here by midnight. 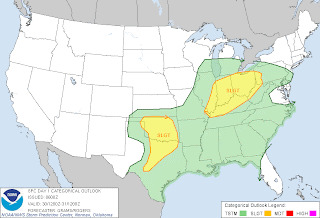 I will be back on with an update on our chances for severe weather so check back in. The weekend MAY have a light shower, but I think most of us will be staying dry with rain returning for Monday, Tuesday, and Wednesday. Temps will be jumping around, 69 Today for the high, 61 Tomorrow, 76 Sunday, 74 Monday, 71 Tuesday, and then upper 50's heading into the end of next week. So seasonal temperatures for the most part. See you on the flip side, later today, but until then, have a good one! The best place to start any story is the beginning. I have compiled a bunch of my photos from the builds and at the end of this blog I have hi-res photos of my finished bikes. I was into mopeds for about a year and a half when my heart was set on getting a Puch. I owned a few and had been on a lot of different mopeds, but the ease of finding parts and feel of riding a one speed, e50, Puch is where I wanted to be. I looked for a while for the perfect Maxi that caught my eye and sure enough one popped up that was scarlet and grey... I mean, I DID graduate from Ohio State. 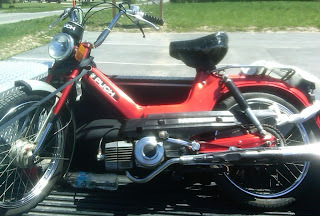 This is a picture of it from April 28, 2010 after I picked it up from the Ebay seller in Tiffin, OH. It was a stock two horsepower that needed some TLC. 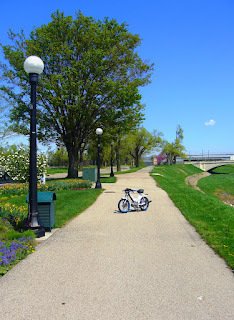 I rode that bike all the time and loved the feel. I ended up putting on a Treats kit, Techno Circuit pipe, 16 SHA, five stars, low bars, Mag dash, among other small things.... well I decided it was time to get serious. I wanted to upgrade to a Polini and with that meant other issues I wanted to address, like stopping better, and the paint was looking a little rough from 31 years. 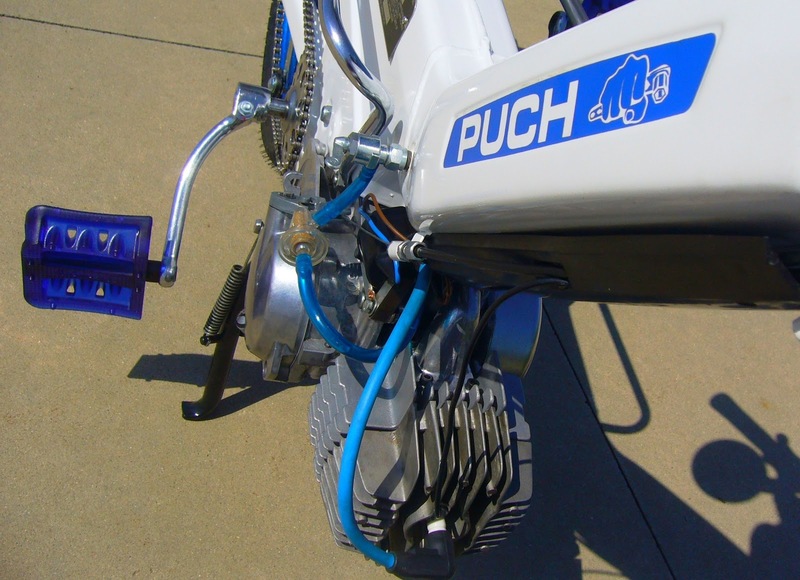 The second bike I wanted to work on was my Puch Magnum. I traded my Motomarina Sebring for the Magnum on August 14, 2011. 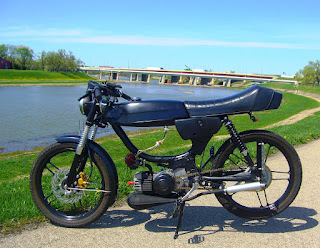 My heart still lies with the Maxi, but the Magnum is a really fun bike to ride. My big problem with the Sebring was the pedals were too high for the cafe seat so with the Magnum stock seat and lower pedals I was able to ride more comfortably for my 6'2'' frame. First thing first, take off the motors to get them ready for my build. I sold my Treats kit and 16 SHA to help expense the rest of the build and sold other small items to offset the plans I had. Last winter when I put on the Treats kit I know I could have cleaned the case a little better, so this time I made sure that my cases were clean enough to eat from. I luckily did not case match when I ran the last kit so my case was completely untouched from stock on the Treats kit on the Maxi. The Magnum had a 65 Metrakit from the previous owner and once I cracked case I could see that the porting on the case was very mild and not completely case matched. So, after about a couple hours of slowly Dremeling and filing, I opened up the transfers for the Metrakit and the new Polini. Huge thanks to Sam Babcock for making me the sweet engine stand for the case matching. Worked out great to stand the stand upright or upside down. Loved the fact that it had two different possibilities for mounting while I was opening up the transfers. Made the job much easier. Rainy days are the best for working on seals and bearings... little heat for the bearings, freeze the crankshafts and cranks... they slide on like butter, with only a little tapping. Both bikes will be running the three shoe clutches and I wanted to brace the clutches to keep them from warping out with RPMs near 10,000. 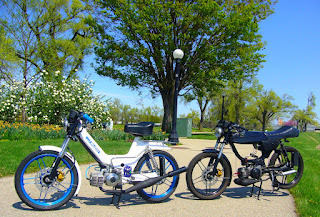 Both have the Paz springs offered by 1977 Mopeds and when I was talking to Dan(owner of 1977 Mopeds), great guy by the way, he mentioned that MLM was coming out with a new design for the clutch braces. Others offer the three shoe or two shoe braces, but no one has made braces that can convert in between the two. That way if for some reason I blow up my three shoe clutch, I can toss the brace on the stock clutches I have laying around. 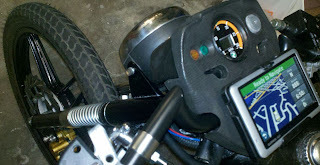 As soon as the MLM braces were ready I mounted those with a little tapping of the clutch pin. 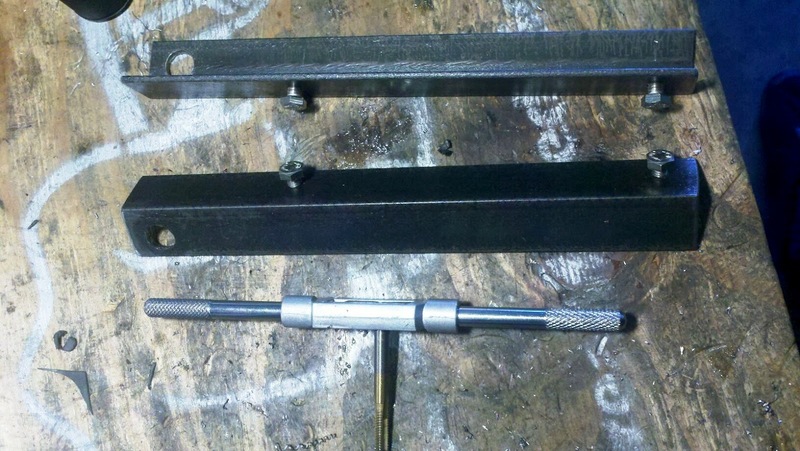 The Briton Bees Clutch Pin Drill Guide, also available at 1977 Mopeds, work great along with a drill press. Just drill, tap, tap, tap, locktite, and...Boom! Ready to blast. 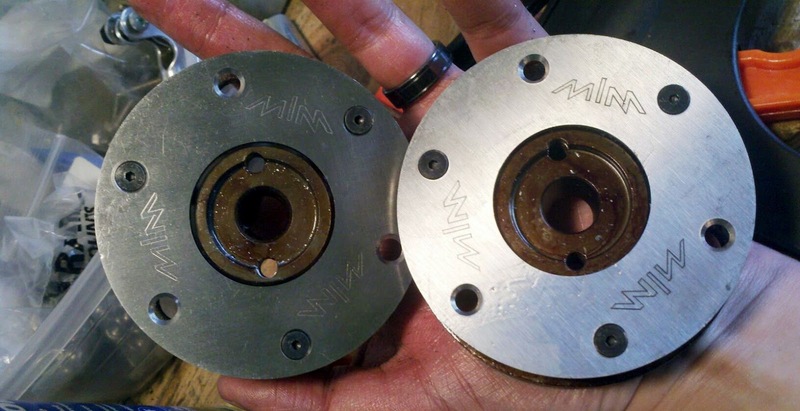 I will be the first to admit that I am not normally known for a super pretty bike, but I wanted to step up my game so I went to town on my clutch covers and polished them up... They probably could use a little more time under the polishing wheel, but it is a step up from before. 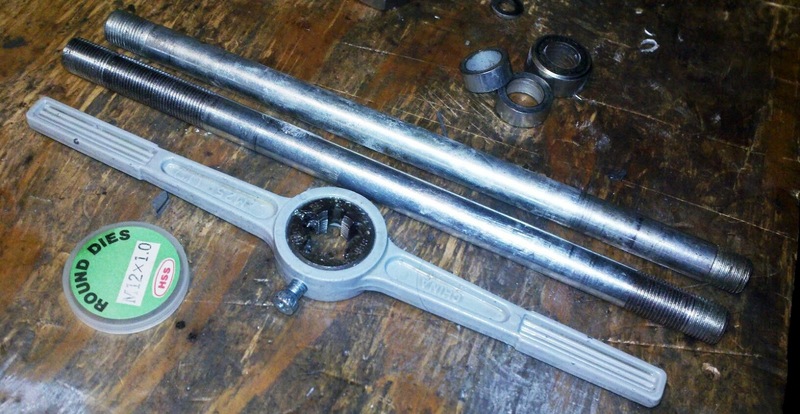 I talked to Gabe from the Bourbon Bandits because as well known as he is at seizing a Polini, I did want to pick his brain a little bit about running spacers in the cylinder stud sleeves. 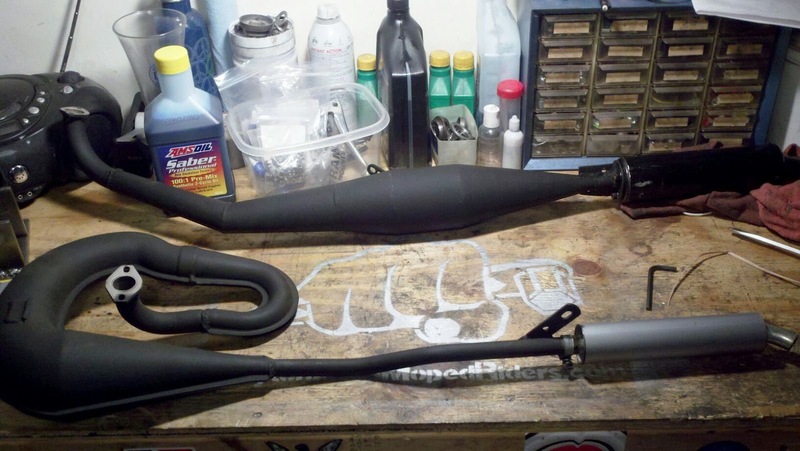 I had a 20 PHBG and thought about running a four petal, which I also have, but after talking to Devin from MLM he highly recommended running the 15 Bing, which is what the Polini was engineered to be running. 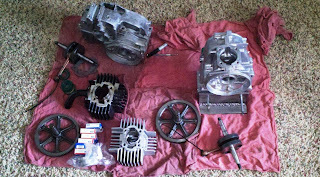 So I am running a hi hi comp head, Polini, stock reeds, 15 Bing, unstuffed race crank, Pazzed three shoe clutch, new MLM clutch brace, points, and plan on running 18x40 gearing for the Maxi. 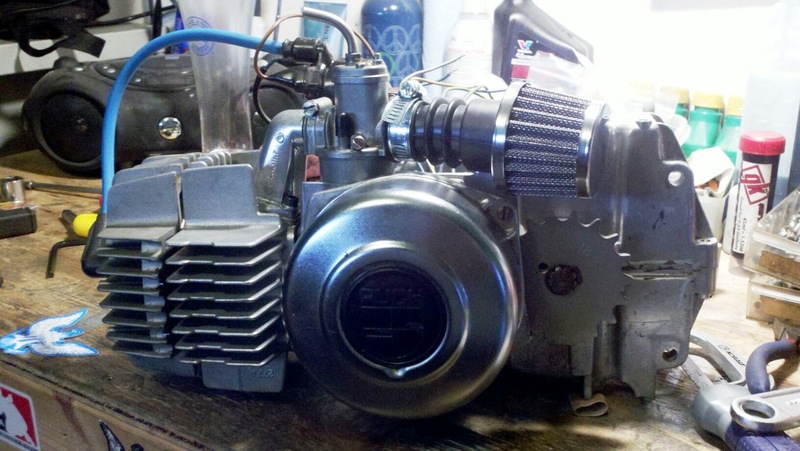 The Magnum will be running almost exactly the same, but the Metrakit with a 19 PHBG, piston port intake, and 17x41 gearing due to the Magnum's extra weight. I will get to the pipes a little further on because I have a SPECIAL pipe. Motors are done, but so much more work still needs to be done. Going fast is fun, but stopping is more important. 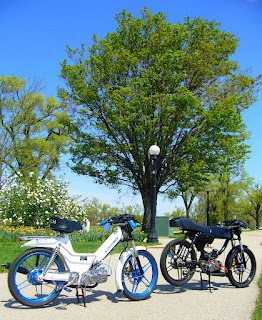 I sold my spokes and planned on running five stars on both bikes. 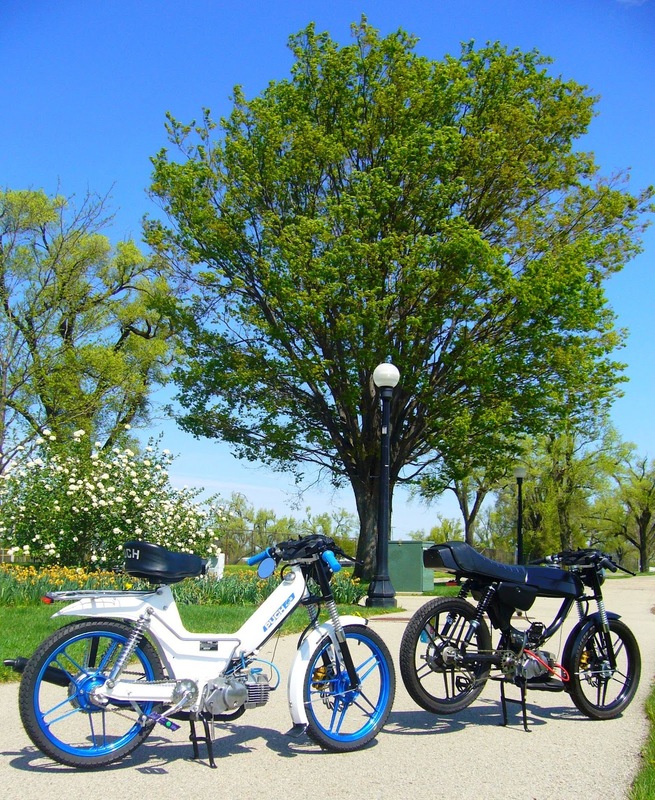 I had a set of beautiful metal flake blue five stars and planned on having my white five stars from the Maxi powder coated black for the Magnum. The first thing I needed to do was convert both bikes to sealed bearings and ditch the loose bearings. Took a few days of work and had to shim the bearings with some 0.5mm shims, but it turned out great. 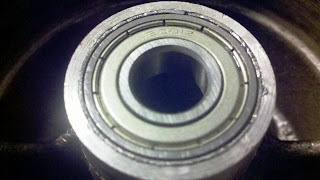 The sealed bearings are as smooth as silk on the new axles. Next step was to switch from the drum hub brakes for the front wheel to Mike Thomas disc brakes. Like I said, going fast isn't fun when you can't stop. I had to do a little fabrication to the hubs to get the spacer rings to fit between the hub and disc, but the Dremel does amazing things with the right bits. I needed about a 0.05 mm taken off the outside edge and then level the bevel on the inner hub because the spacer would not clear the little hump. 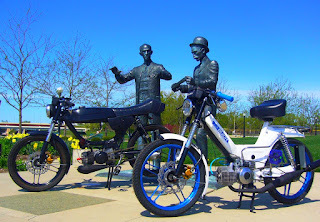 Once the wheels were finished I needed to move on to the front forks because they were stock or the EBR spring forks and could not take the torque from disc braking. 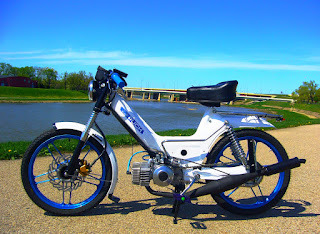 When you would brake it would make the forks twist and possibly lock up your front wheel from the torquing alone. Hydraulic forks are the best because the beefy tubes inside one another really will keep from twisting. Hundreds of people have talked about the "Cheap Hydros" on a Moped Army forum thread. 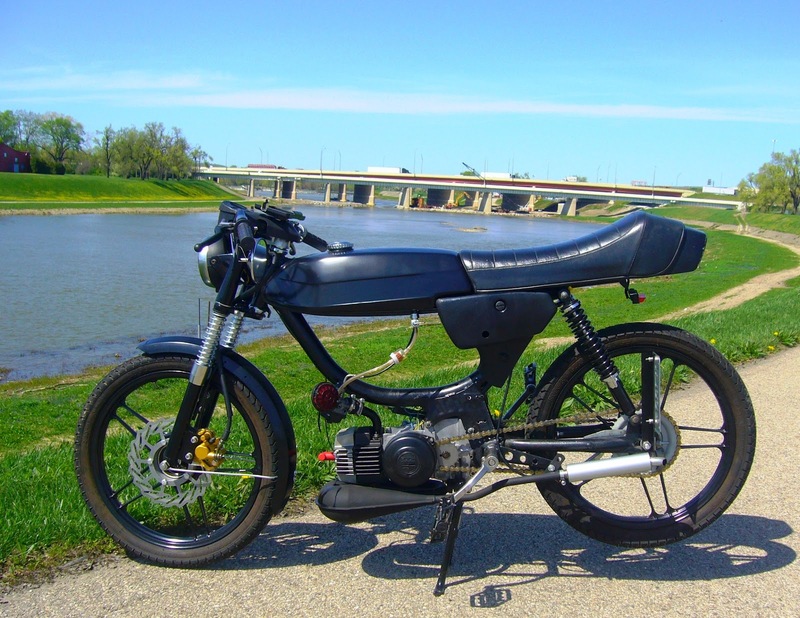 Normally if you pick up a set of forks for mopeds that are hydraulic you can expect to drop at least $200, so that would be $400 for both bikes... not liking that at all. So I did some research on the "Cheap Hydros." They are k10 Suzuki hydraulic forks that people bid on Ebay or order online for only $40....MUCH cheaper. As I was doing my research I found out that the store that was selling these online was located only an hour away from where I lived. So rather than pay for the shipping, another DAM Rider, Jake Miller, and I took a trip to Versailles to pick up two forks. The shop was mainly set-up for custom motorcycles, dirt bikes, go carts, but nothing moped related. 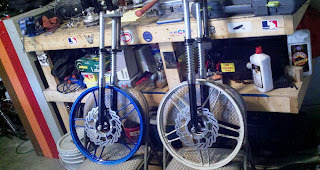 I did have to do a little fabrication on both forks to convert them to my Puchs. 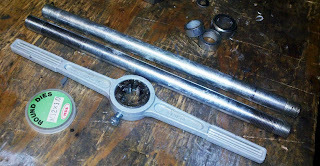 New bearings, cups, add a shim or two, grind down a couple of tabs, bore out the axle to 12mm, not too bad. 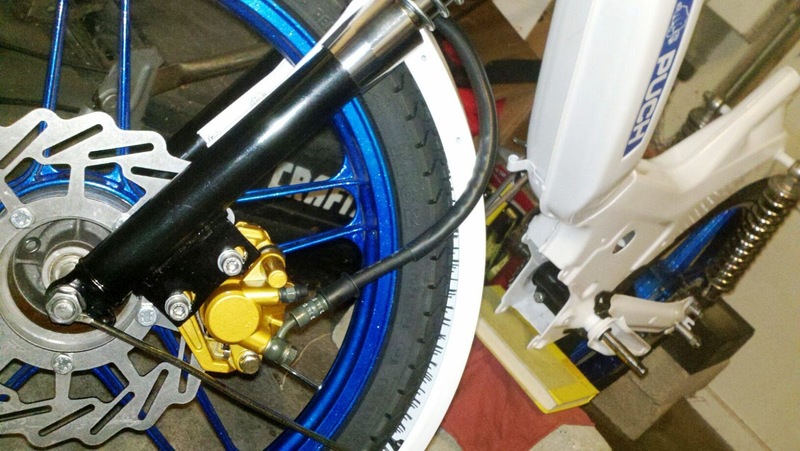 My next task was to get them ready for disc brakes since they were designed for drum brakes. 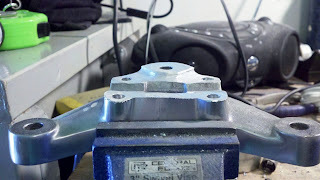 I used quarter inch steel and drilled out the mounting holes and then opened them up a bit so I could move the disc brake caliper around a little to get the caliper as close to the disc as possible. I have never welded and would love to learn, but I left this up to one of my friends who is skilled in this area. The big concern is keeping the heat low. 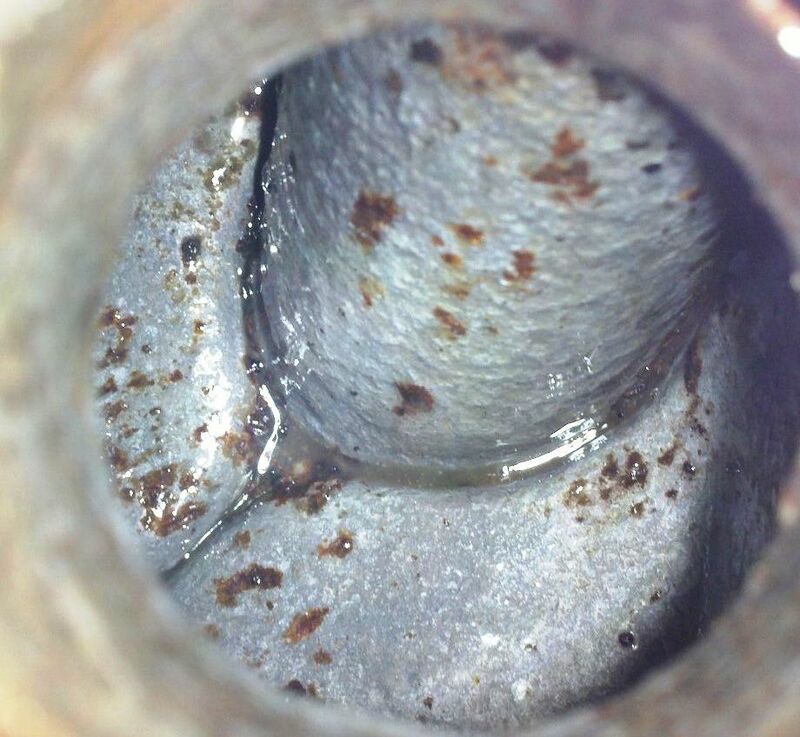 Well, that is the concern AFTER you drain all the hydraulic fluid and leave the tube open so you are not expanding the gases. But you do not want to overheat the tubes because the steel will bubble on the opposite side and then the forks will not work properly or slide inside. We tacked the tabs on, then welded a quarter of the tab at a time and then cooled it off with water each time to keep it cool. Polish those bad boys up and you are ready to hit them with some paint. I was very pleased at how they turned out as you will soon see in the photos below. 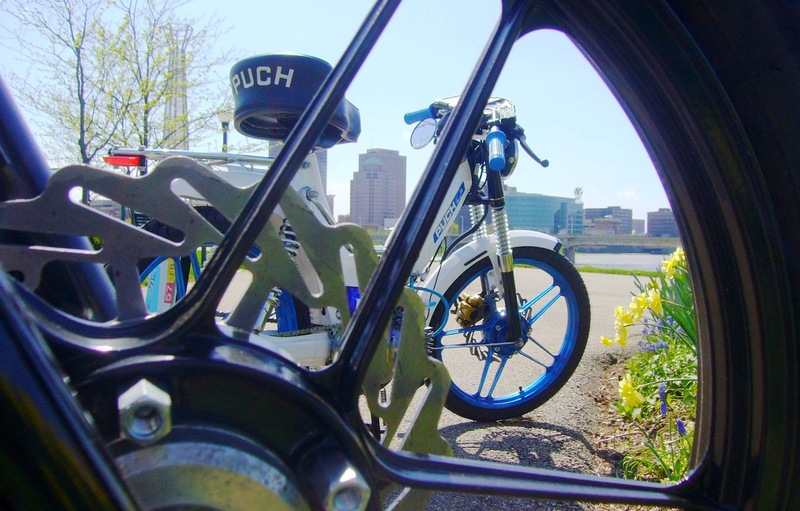 The top of the triple tree was set-up for the k10 bars, but I wanted to run my Mag dashes so I needed to grind down the aluminum so my new bars would work with the Puch handlebar clamps that ride under the dash. 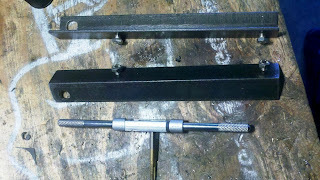 Dremel out the handlebar clamp bolt holes a little more to match the dash and these are ready to go. Next is to mount the tires on the five stars and WOW, they look great. I only run Michelin Gazelle tires now because they are nearly bullet proof. 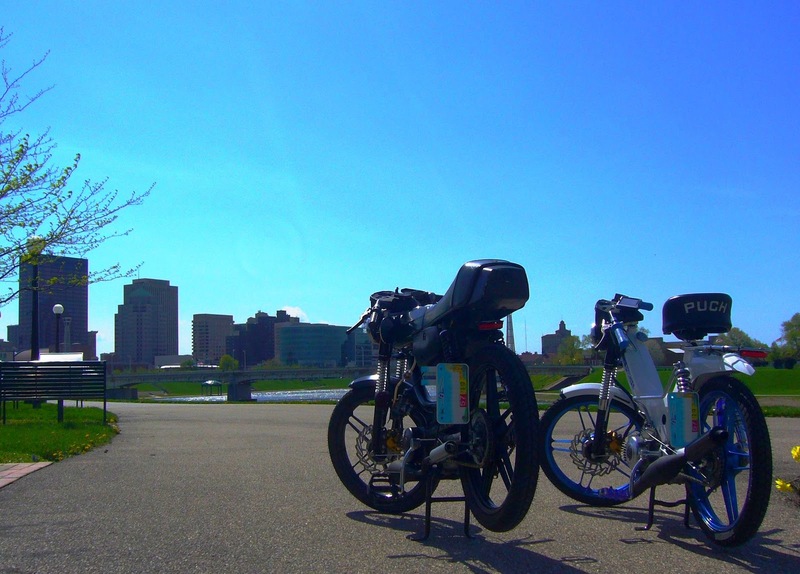 You can still ride, even if your tire is flat because the tires are so firm. Now time to do a little mock-up. 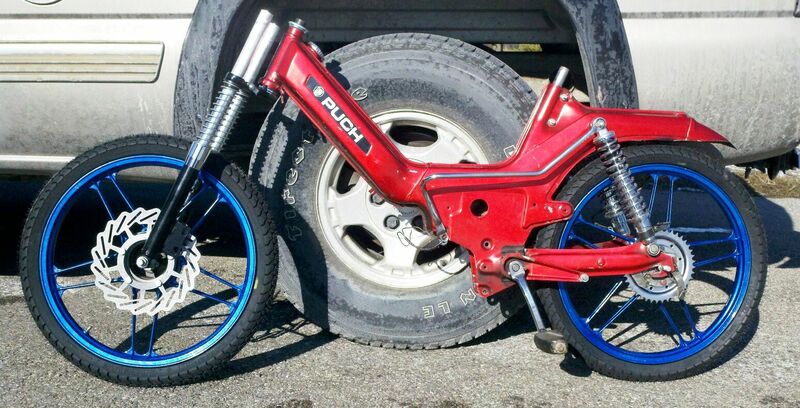 I had debated for a while making this into a red, white and blue bike with the stock paint, but after a lot of thinking and looking at this mock-up, I decided otherwise. I loved the blue and wanted to incorporate that into a new color for the body. I found a powder coat company in Franklin, OH, Legacy Finishing, and they had great prices for white and black because they use it so much for semi rims. 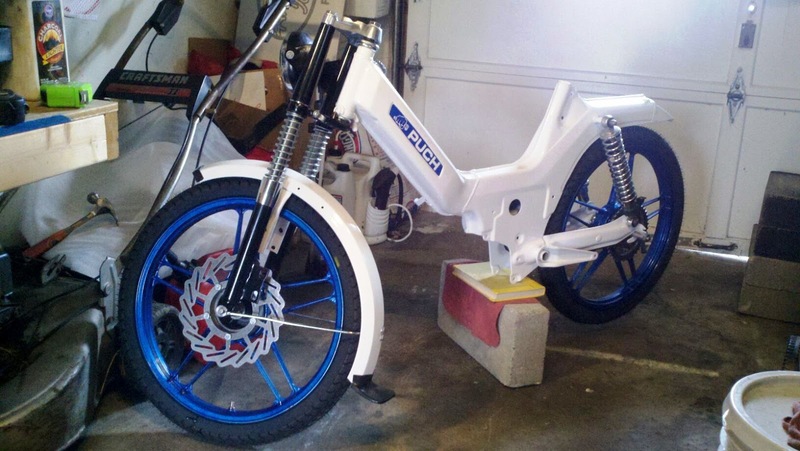 I decided to go white with the frame so I took down the Maxi frame, exhaust pipes, Magnum tank, five stars, fenders, and kick stands. I wish I would have taken my Magnum frame, but that will be next winter's deal because the DIY paint job the last owner did is chipping in a few places. Nothing you would notice from ten feet back, but I would prefer to keep that bike clean, but for this year it will still look pretty, just not REALLY pretty... so while that is away, I get to work on some other goodies. I know a lot of people do not like the luggage rack on the bikes, but I do on the Maxi. 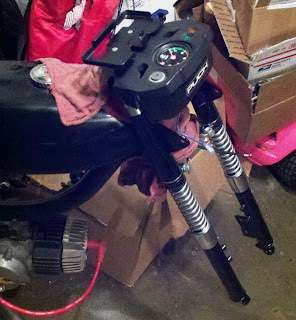 Since I chopped off the back fender I needed a place to mount my tail/brake light and the rack works perfect for that. I have been running this LED light on my Magnum for a year and it works great. 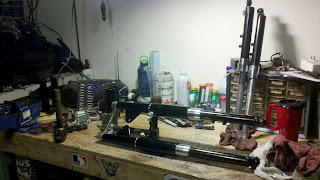 Since I had the Magnum frame still in the garage I could work on mounting the front forks. They bolted up nicely after my fabrication. The next task was to work on the goodies I wanted to do. 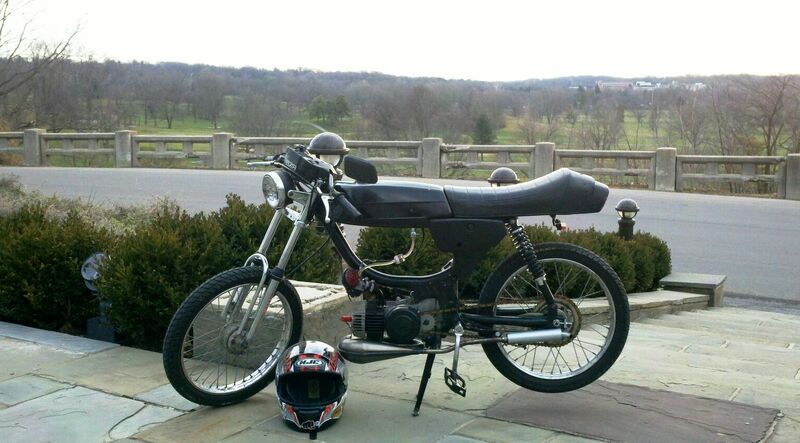 Since the stock Puch speedometers are nearly a joke, I decided I wanted to run GPS on both bikes so I found a cheap GPS on Craigslist. The mounts I got off Ebay will wrap around the GPS and keep it from bouncing around on the road. The bolt holes for this were perfect for the handlebar clamps. The only problem I had was the bolts intended for this were much smaller, so I had to take the hex head of long 6x1.0mm bolts and grind them a little smaller to fit in the hex hole. While the bolt was still hot I pulled it snug into the holes to make sure it finish flush and it melted a little mold into the plastic of the mounts. 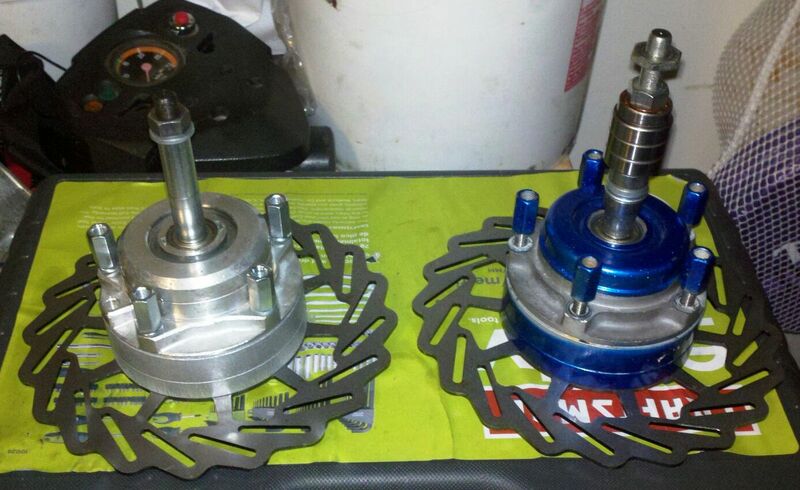 Turned out great, bolt them down with a few washers as a spacer... good to go. Since the speedo would not be telling the speed, I needed a place to mount my temp gauge so what better place than the speedo housing. I cut in a rectangle into the original backplate and bolted it down. I did chop up the internals so I could use the original speedo cable's threading to pull it tight into the dash. From the top you cannot see the fabrication underneath that looks a little rough, but the top...so now I will know my cylinder head's temperature and it looks great! Once it was all mounted I had to take another photo because of how clean the front end was setting-up. 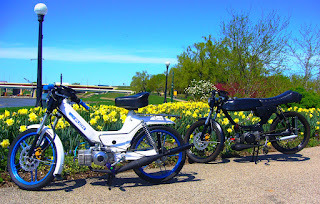 I am very stoked to get out and ride, but I was still a month away before both builds were ready. 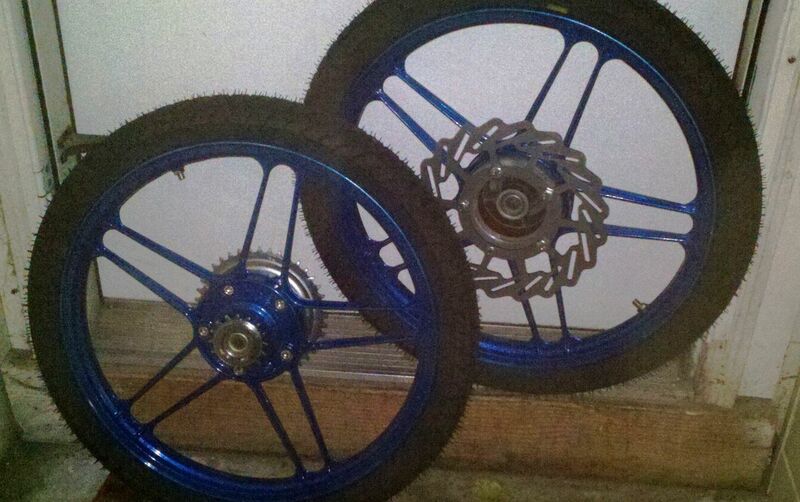 Powder coat took a little longer than expected because of the aluminum wheels. The steel was easy for them to strip, but they had a little more of a rough time on the wheels. However, they finally got them nice and pretty. 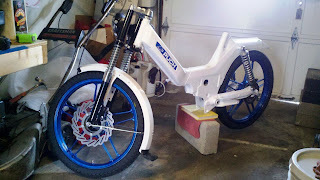 I wanted to keep my white Maxi build under the wraps for a while so I would take photos as a tease and posted them on our club's website and I think I made a few of them dis-shoveled with all the teasing. 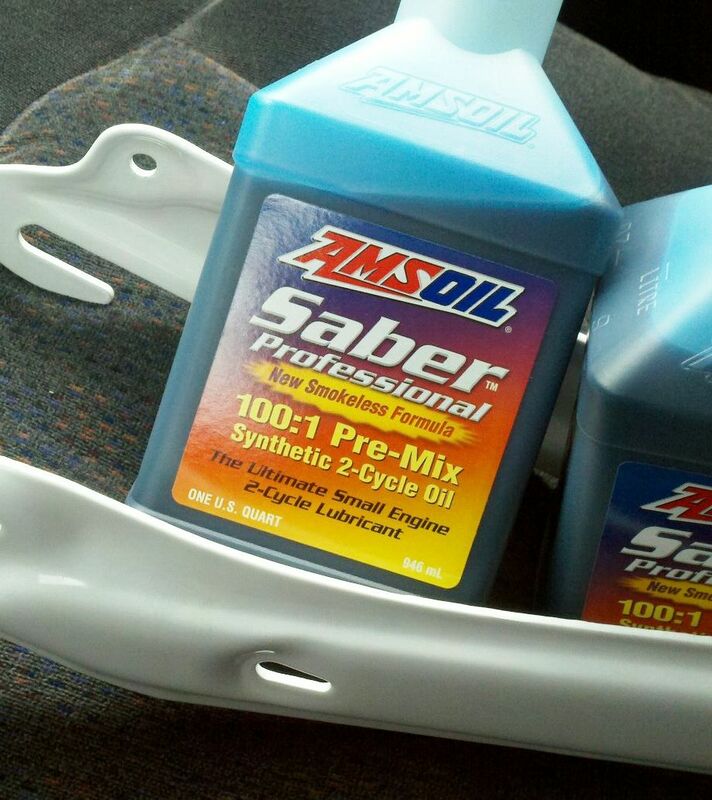 I also picked up some Amsoil Saber two stroke oil because Polinis are notorious for seizing on the exhaust port with the piston catching. 1977 Mopeds has a great blog on their site where they talked to Polini USA and the reason was because people are running 40:1 oil or other rich mixtures and the oil burns hotter. The extra heat causes the piston to expand and the piston/ring catches the exhaust port so they recommend running a leaner mixture and it is hard to find any oil you can run leaner than Saber at 100:1. I read online that someone ran 200:1 by accident for a while and didn't seize. I will probably run 70:1 for the first couple hundred miles while I am breaking in the bike and then bump up to about 90:1. I did clean up the inside of the gas tank a little more to remove any dirt, rust, or 31 years or any build-up. I did it before, but I wanted to do it again before I put the bike back together since the frame alone is much lighter than the entire bike. I did my vinegar mixture with a handful of nuts that I will never use... shake, shake, shake, get those flakes out, let it sit a week, then much better and getting closer to riding. I had the exhaust pipes powder coated in high temp black, giving a little love to the Black Pipes moped club from Youngstown Ohio, haha. I really just wanted the dirt and grime cleared off and the powder coater gave me a great deal since the wheels were taking so long. I am running the Proma Circuit on the Magnum to help with its low end and the other pipe is a very special pipe. Devin Biek has been making some SICK pipes at Motion Left Mopeds really pushing the boundaries of performance by using computer apps to maximize the potential of the expansion chambers. The first pipe he ever built was for KZ and then KZ upgraded and gifted me the very first pipe that Devin had ever created. 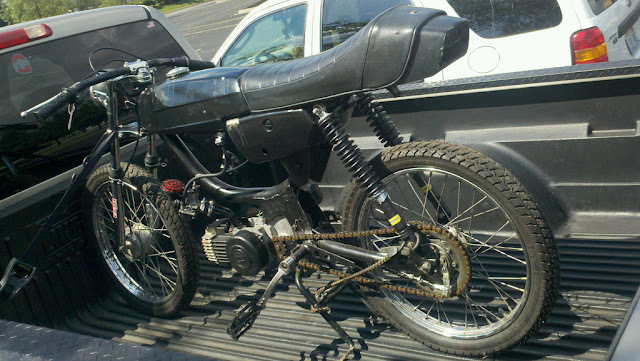 I am very excited to run it on my bike and see how it performs. So motors are done, goodies are done, pipes are ready, tank is clean... on to the next step. The decal turned out perfect for the tank. Perfect fit, perfect look, perfect color. The wheels on Maxi bolted up perfect and the white fender really helps pop the blue a little more by outlining the tire. There are always small things that come up. The rear axles were about 30mm too long so I had to cut deeper threads into them so I didn't have to run spacers. I bought a 12x1.0mm threaded die and cut down deeper and they are dreamy now. I also needed a way to mount the license plates since the rear fender was chopped on the Maxi and the Magnum doesn't have a fender. With the extra space on the axles I decided to make a bracket to mount them vertically from the axle. I cut down some angle iron, drilled a hole for the axle, drilled the bolt holes, and tapped them so I could just torque down on the metal. Afterward I added a nut to the other side just as a precautionary measure. Primer, paint, clear coat... done! The bikes fired up great with only one kick for the Magnum and three kicks for the new Bing carb, on the Maxi. As always, gotta finish off the blog with the forecast. 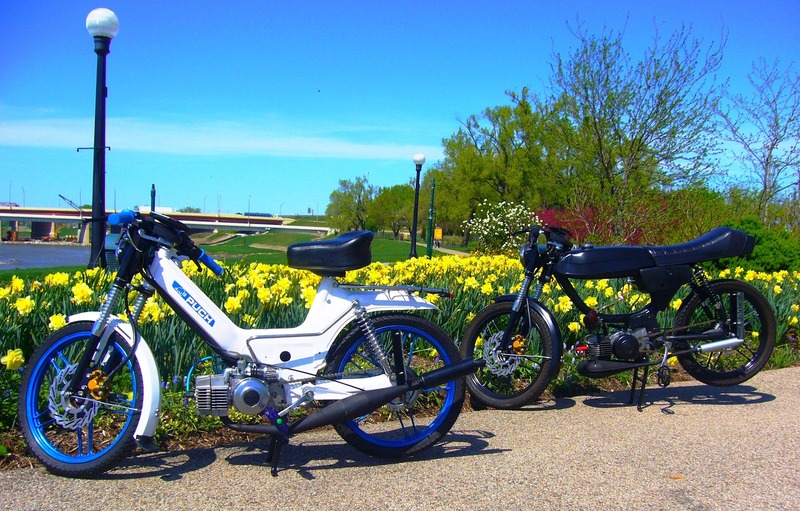 Today is looking like GREAT mopeding weather. We will be mostly sunny with cool temperatures and a high of 58. Clouds roll in tomorrow and we could see a few showers and storms tomorrow. Some of the storms may be strong to severe in the afternoon and evening. 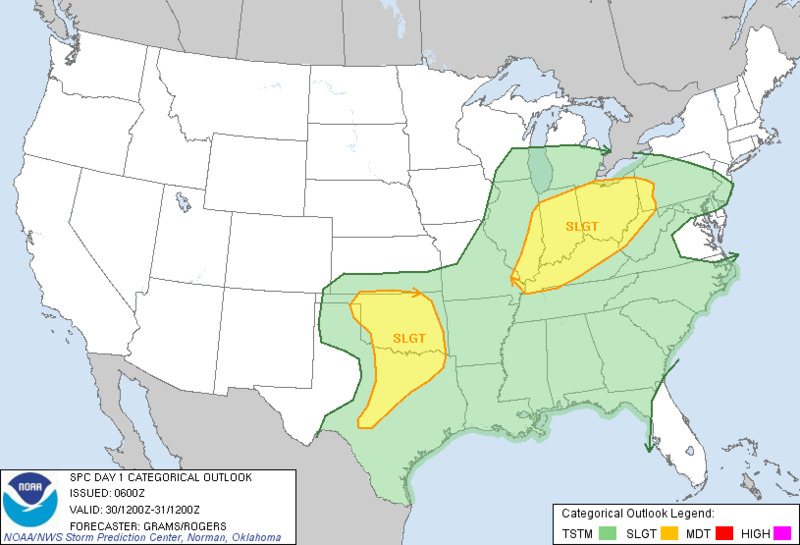 I will break our chances down for severe weather a little more tomorrow. We will dry out for the weekend with mild temperatures and a BEAUTIFUL weekend. Rain returns early next week with mild temperatures giving way to cooler weather for the end of next week...which we will worry about when it gets closer. Enjoy the beautiful day and have a good one! After making all my co-workers listen to me talk about my rebuild and having some serious discussions about the build, I brought my bike finished into work to show them. We also fired it up and the studio had a hint of two stroke smoke smell for a little bit. Good times.